Should you get an energy audit? According to Lawrence Berkeley National Laboratory, the average American household spends roughly $2,060 per year on energy costs. This money is used to heat your home, power your appliances and lighting, and more. The amount you spend on energy depends on the type of fuels used (from electricity, to oil, to propane, to wood in a fireplace) and the rate price at which it sells for in your area. The price of these fuels may be outside of your control as a property owner, but one thing is sure; the less energy your home consumes, the more you’re going to save on your electricity bill. One way to make sure you’re being as efficient (and, therefore, as conservative) as possible in your energy spending is to go through a home energy audit. An energy audit is an assessment of your home that takes a look at current energy consumption and then identifies energy efficiency measures that you can conduct to make your home more efficient. An energy auditor can assess where your home is losing the most energy, and then proposes improvements to make to help save energy – and reduce your utility bills. Professional energy audits can take anywhere from 30 minutes to 4 hours to complete, depending on the size of your home. These professional auditors use a variety of tools to establish problem areas within your property, and come up with a list of suggested measures and actions that you can take in order to make your home more efficient. Most professional audits will include a blower door test. This is a device that allows them to locate air leaks in the home. During a blower door test, all the windows and doors are closed, and they’ll use a blower door machine to depressurize the home. At that point, the auditor uses an infrared camera to see where cold air may be leaking into your home. 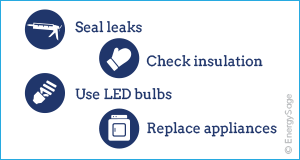 These are some of the more common steps taken in an energy audit. However, depending on the scope and the tools in your energy auditor’s arsenal, there may be some additional steps taken (such as thermographic inspections). The recommendations that your energy auditor makes for your home depends on the scope of the audit. Some lightweight suggestions may be switching to more efficient lighting, sealing air leaks from doors or adding weather stripping. Some larger suggestions might include more insulation, or replacing windows that are causing drafts in your home. How much does an energy audit cost, and how much can you save? What you pay for a professional energy audit can depend on the company and the size of your property (some companies offer fixed rates, while others will charge more for a larger home). That being said, do your research – some utility companies, nonprofits or governmental organizations specific to your local area may offer free energy audits. Even as a paid service, the upfront cost for an energy audit audit and for the following energy efficiency measures taken will be worth it when you’re saving on your electricity bills later on. 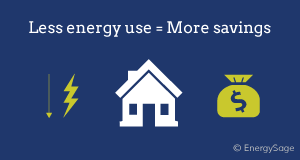 By making energy efficiency upgrades in your home, you can save five to 30 percent on your energy bills. While having a professional do your energy audit is the best way to identify the problem areas in your home, there are a few energy savings tips that can help you make energy efficiency improvements on your own. If you notice an especially drafty area of your home, inspect the area for leaks. Leaks are especially common at junctures between walls and ceilings, at doors, by windows, and at electrical outlets. If you locate a leak, you can seal it using weatherstripping or caulk. Take a look at the insulation in your attic, as well as possible sources of leaks around your heating and cooling equipment. Simply switch out your lighting for more efficient options (LEDs, CFLs, or energy-saving incandescents) is a quick way to cut your electric bill. If you’re considering replacing any of your appliances, keep an eye out for energy efficient options that consume less electricity than their standard counterparts. If you’re spending a lot on your energy bills, any time is the right time to get an energy audit. The sooner you make updates to your home to make it more energy efficient, the sooner you’ll start saving money. That being said, you might want to keep in mind seasonality. Many houses feel drafty or cold in some areas and warm in others during the winter. If you live in the Northeast and spend a lot of money on energy during the winter, it might be a good idea to get energy efficiency measures complete before the cold weather kicks in. This logic works the other way as well – if your electricity costs are high in the summer because of central air conditioning, having an audit and time to perform energy efficiency measures before the highest temperatures come may be the best route.